Woodbridge, VA---The 2019 Potomac Nationals Seasonal Job Fair will once again take place at Northwest Federal Field at Pfitzner Stadium. The P-Nats will host their annual job fair on Thursday, February 28th from 4:00pm-6:00pm. The Potomac Nationals Baseball Club, the premier family friendly entertainment destination in Northern Virginia, is looking for outgoing, dependable, and customer-service oriented gameday team members to join the staff of The Red, White, & Blue. The P-Nats' 2019 regular season begins on Thursday, April 4th and runs through at least Thursday, August 29th, with potential postseason games to be scheduled through the first two weeks of September if the P-Nats qualify for the 2019 Carolina League Playoffs. At the job fair, P-Nats front office officials will seek dedicated candidates to join the team as part-time gameday employees for the full season, who may also be tasked with working non-gameday special events at Pfitzner Stadium. The P-Nats offer seasonal positions, perfect for school employees, students, retirees, and others who love the game of baseball, and all that are looking for a fun and flexible part-time opportunity in an upbeat professional sports atmosphere. The majority of weeknight (Monday through Friday) P-Nats games at Northwest Federal Field will begin at 7:05pm, while Saturday night games start at 6:35pm. Sunday games will start at 1:05pm throughout the season. There will be 1:05pm start on Memorial Day (Monday, May 27th), a pair of 12:05pm starts (Tuesday, July 9th, and Thursday, August 1st), as well as a special 6:35pm start time for July 4th. All departments typically require gameday employees to be on site at Northwest Federal Field at Pfitzner Stadium a few hours in advance of the game's start time. On-site interviews will be conducted at the job fair by P-Nats full-time employees on a first come, first serve basis. No advance appointments will be accepted. Job applications will be available on site at the job fair, or job seekers may download an application in advance at www.potomacnationals.com. For online access to a P-Nats job application, download the application at: https://www.milb.com/potomac/ballpark/employment. Applications for part-time employment will not be accepted prior to the job fair. For further information on seasonal opportunities with P-Nats Baseball, contact Potomac Nationals Stadium Operations & Merchandising Manager, Will Darmstead, at 703-590-2311 ext. 237 or via e-mail at wdarmstead@potomacnationals.com. 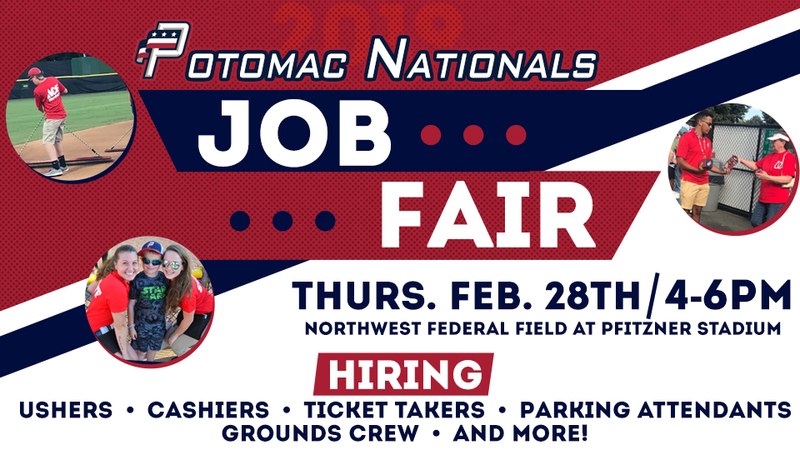 If you can't attend the job fair but are interested in applying for a part-time position with the Potomac Nationals, you may pick up an application at the P-Nats front office Monday through Friday from 9:00am to 5:00pm and return it to Will Darmstead on or after February 28th. If you choose to print out the online version of the application, you may scan and e-mail the application to wdarmstead@potomacnationals.com, fax the application to 703-590-5716, or bring the application to the front office on or after February 28th. To schedule an interview after the job fair, contact Will Darmstead (see above contact information).